Each year thousands of British tourists eagerly flock to the serene and picturesque heart of France via Limoges Airport yet many are blissfully unaware of the site of the Nazis’ most evil, cowardly and barbaric atrocity in France which lies just a few kilometres away. 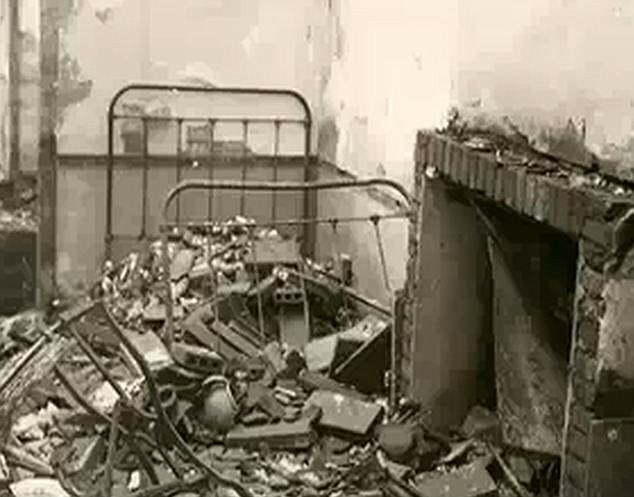 So why is so little known about Oradour-sur-Glane yet far more people know about Anne Frank’s house in Amsterdam and the work camp at Auschwitz? Are a people haunted by guilt? Oradour-sur-Glane is a tranquil village in the rural département of the Haute-Vienne: an area of natural, rugged beauty resembling a Gallic Peak District. An area famed for its cattle, hunting and porcelain, where eagles glide majestically through the sky and wild boar and deer live in the forests. An area where the locals are proud to call themselves ‘paysans’. The Allies had successfully landed in Normandy several days before so the villagers may have already been looking forward to the ineluctable defeat of the heinous Nazi regime and a post-war return to a life of liberty, equality, fraternity. This village had probably existed in harmony with nature for hundreds of years until 10th June 1944 when a unit of Der Fuhrer Regiment: 2nd Waffen-SS Panzer Division Das Reich descended upon the village like a pack of wild dogs or rabid Alsatians. No-one really knows why the SS decided to destroy this village and murder all its inhabitants. It was not known for harbouring the French Resistance or hiding caches of weapons. One story was that a German officer who supposedly escaped from the French Resistance told his superiors that they intended to burn him alive hence the SS wanted to seek retribution amongst the local population (a common practice within the German Army in both WW1 and WW2). The SS rounded up all the males in the village and split them into small groups. They then shot them in the legs so they could not escape but would not die. They were then covered in kindling and set alight. The women and children were all herded into the village church where the Priest bravely tried to save them; telling the SS that the Catholic Church was a house of God and that these were innocent civilians who had harmed no-one. Their response was to shoot him before barricading all the women and children inside the church before throwing phosphorous grenades inside: burning everyone alive. One woman managed to survive by crawling out of a window and hiding in the fields until nightfall. A total of 642 innocent civilians were murdered that day including 247 children; the youngest victim being just 10 months old. Only the men who had left early that morning to work in the fields had survived. As a final insult, the SS buried what remained of the bodies in a mass grave. The remains of the village rest as the French Resistance found them the next day. Charles de Gaulle insisted that nothing be touched. After 71 years, the Doctor’s car still stands idle, gently rusting away, next to the door of the house of the patient he was tending on that apocalyptic day. The remains of a baby’s pram still lie near the altar of the church. Bullet holes still pock-mark the walls of the church. There is an eerie silence in the ruined village as though the local birds know to keep away. Walking round the graveyard is a more harrowing experience as you pass one mass grave after another showing the enamel portraits of several generations of the same family butchered on the same day. So what could drive someone to burn alive a 10 month baby? Why would anyone want to kill an unarmed woman or child? Could this type of atrocity still happen today? Have humans learned any lessons from Oradour-sur-Glane? Rwanda, Srebrenica, 9/11, 7/7, ISIS, Tunisia, the Ukraine. What type of philosophy could turn a human being into a depraved murderer? Or is cruelty inherent in many humans? In the case of the Nazis it was their hatred of Jews and Bolshevism. So why did they murder a Catholic Priest? The SS was fundamentally split into two groups: the SS-Totenkopfverbände, or the Death’s Head Units, which ran the concentration camps and the Waffen-SS which was its fighting arm. This particular Waffen-SS Unit had fought on the Eastern Front for several years where they were taught that Slavs were sub-humans (along with Africans) so were encouraged to annihilate everyone in their path. Many Europeans were seduced by the odious philosophy of the Nazis and joined the SS. For Ukrainians it was the chance to kill the hated Soviets. Another little known fact of WW2 was that it was the Danish SS who were defending Berlin when Hitler did everyone a favour and committed suicide. So many French joined the SS that they had their own, ironically-named Charlemagne Division. 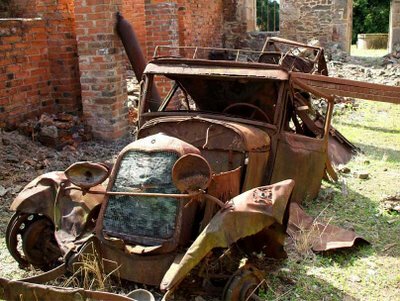 So what is the sting in the tail about Oradour-sur-Glane? The fact that the French Foreign Legion eagerly accepted the SS into its ranks after WW2 and sent them off to Indochina? Or the fact that the perpetrators were never brought to justice? Or that the SS Officers were given sanctuary in the Soviet bloc after 1945? Something to ponder if you ever get the chance to visit the martyr village of Oradour-sur-Glane. I guess in regard to ‘why’ that those with the drive to commit atrocities beyond imaginable were allowed to flourish and were encouraged. Suddenly frightening and murdering people became legal. With it the opportunity opened up as well for those who wondered what it was like to try it without fear of recrimination. Those who did not participate were killed as events unfolded and likely concentrated the numbers of enthusiastic participants. Recalling a woman a week is killed in Australia in the act alone of domestic violence puts a spin on how capable the human being is of committing murder. This is my first knowledge of this village. There has been a lot of publicity about this crime including a movie that we saw a few years ago. Anyway, on the domestic Labor front, at least the initiative has now been taken with a good chance of getting rid of that Goebel’s of a PM. Hopefully Abbott will be on the defensive from now on. A pity that the turn back boats hasn’t been tackled but that might change when ALP gets in power. I reckon it will Gez. I think Shorten is just playing a game of political poker at the moment telling the rednecks what they want to hear. Once elected can then do an Abbott and simply change his mind and the right wingers will have to sit there and eat humble pie, providing they have time to change feet. Appalling cruelty.By one account they crucified a baby in the village square. One can imagine being so angry one could commit murder, but what could these villagers have done to incite such hatred? Why does our current government treat asylums seekers with such contempt? Our government looks more like the Nazis every week. I want to come back as a peace loving cat. There’s quite a lot about this massacre online, I found. Thanks for sharing this on the 70th anniversary of the end of World War 2.Utter cruelty. What was the point of this war crime. What is the point of war. Did World War 1 ever finish given whats happening in the Arab world currently. Not a pleasant account to read. Looks great. The photo is on my mobile of the tombstone in the cemetery. Have you guessed the sting in the tail? I lefta couple of clues in the commentary. All is well here thanks. No. 2 due on 1st August! Any plans to visit Europe?